The Comal and San Marcos Springs are the largest major springs in the San Antonio segment of the Edwards Aquifer in central Texas, and among the largest springs in the southwestern US. The Comal springs network in New Braunfels includes 9 main springs and hundreds of smaller springs, many located under Landa Lake. Likewise, the San Marcos springs network in San Marcos is made up of hundreds of small springs under Spring Lake. Why do we need to know Springflow? This spring water provides habitat for endangered and threatened species that are required to be protected, provides water for supply and recreational uses, and provides fresh water that flows to the Guadalupe River and to the Gulf of Mexico. Water resource managers must know the amount of springflow to make daily decisions to balance the many water needs, particularly during periods of low flow. 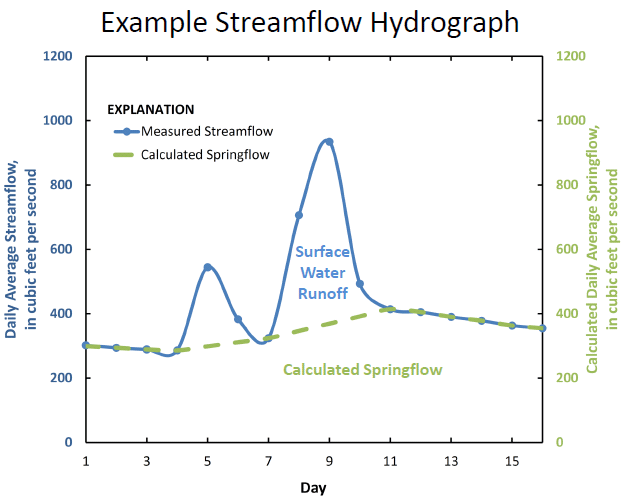 What is the difference between Springflow and Streamflow? Springflow cannot always be measured directly at Comal or San Marcos springs. 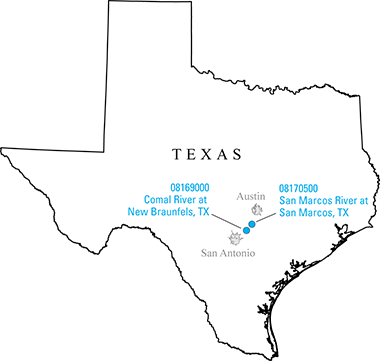 Instead, the USGS measures streamflow at two gages located downstream from the spring networks, Comal River at New Braunfels and San Marcos River at San Marcos. Streamflow is made up of springflow (from springs and seeps) and surface-water runoff (from storm events). During non-storm periods, all streamflow at these two gages comes from springflow. During storm events, the relative contributions of springflow and surface water runoff are estimated by USGS staff. After the storm events, springflow is recalculated using a computer program following standard springflow separation methods and the previous estimates are updated with the newer values. The computed springflow values are calculated and checked each weekday before being released online. Spring Lake in San Marcos is entirely sourced from spring water. USGS scientist measuring flow downstream of the Comal springs network. USGS is able to calculate the separate measured streamflow into springflow and runoff components. The interactive graph shows both the daily average streamflow and the computed springflow for the past 1,000 days. What is the difference between streamflow and springflow? or ... Why is springflow the same as streamflow most of the time, but not all of the time? Streamflow is the combination of surface-water runoff and springflow. Surface-water runoff, as its name suggests, is the overland flow resulting from rainfall that is not absorbed into the ground. Springflow is the groundwater contribution to streamflow, often in the form of springs or seeps. During dry weather, springflow makes up the majority of the streamflow. What is the difference between realtime unit values and daily averages? or ... I checked streamflow earlier today and now I see that it has changed. Why is that? The USGS measures streamflow at gaging stations every 15 minutes, commonly referred to as real-time measurements. The daily average streamflow is the average of the 15-minute streamflow measurements over the course of that day. Springflow is based on the daily average streamflow, not on the 15-minute streamflow data. Learn more: How is daily average streamflow measured? Why did the estimated springflow change between yesterday and today? or ...I downloaded last month's data, and now I see that the value for some of those past dates has changed. How can that be? During storm events, the computer program is not able to separate streamflow into surface-water runoff and springflow; hence, the springflow is manually estimated by USGS staff. After the storm event, the computer program is rerun and the estimated values are replaced with the computer calculated values. Historical values may also change when the USGS performs a series of quality-control checks as part of reviewing the data. For example, routine streamflow measurements are made at the site to ensure the reported values are accurate. The reported values may be updated slightly to match the field measurements more closely. Learn more: How is daily average springflow calculated? The reported springflow values undergo multiple quality control checks. As part of those checks, some springflow values may be temporarily removed until all of the QA/QC processes are performed and the data are finalized (e.g., when “shifts” are applied to historical data). Click site markers for site information. Two of the main orifices of Comal Springs. There are many other orifices where springs discharge from the Edwards aquifer, including several under Landa Lake. Comal Springs of Central Texas are the largest springs in the southwestern United States. 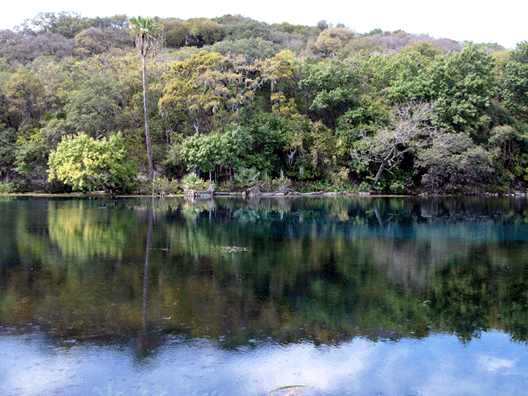 The artesian springs emerge at the base of an escarpment formed by the Comal Springs fault. The Comal River is approximately 2 miles long and is a tributary of the Guadalupe River. USGS 08169000, Comal River at New Braunfels - 1882 to Nov. 1927 (discharge measurements only), Dec. 1927 to Sept. 1932 (daily mean discharges below base, and stage-discharge relation is not affected by backwater from Guadalupe River), Oct. 1932 to current year. USGS 08168710, Comal Springs at New Braunfels - Dec. 1927 to Sept. 1932 (fragmentary daily springflow discharges), Oct. 1932 to current year. Spring Lake at San Marcos. The San Marcos springs issue from the Edwards aquifer at the bottom of the lake. 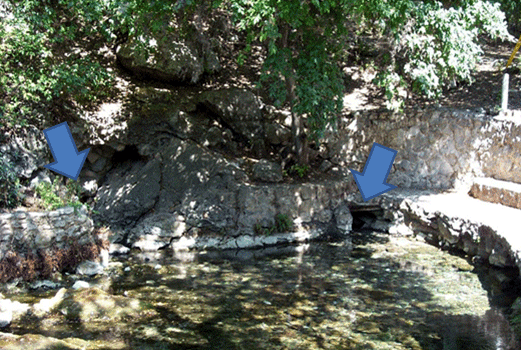 San Marcos Springs is the second largest spring in Texas and is the headwaters for the San Marcos River in San Marcos. Spring Lake was built in 1848 at the site of a marsh formed by the springs to provide hydropower to a mill. The San Marcos River originates from the 15-acre lake and flows approximately 4 river miles (mi) south to its confluence with the Blanco River. USGS 08170500, San Marcos River at San Marcos - July 1915 to Sept. 1921 (daily mean discharges below base discharge), May to Sept. 1956, Oct. 1994 to current year. USGS 08170000, San Marcos Springs at San Marcos - May 1956 to current year. How is daily average streamflow measured? How is daily average springflow calculated? Streamflow, also referred to as discharge, is the amount of water in the river that passes by a location during a certain amount of time. It is commonly reported in units of cubic feet per second (ft3/s). Streamflow is the combination of surface-water runoff and springflow. Surface-water runoff, as its name suggests, is the overland flow resulting from rainfall that is not absorbed into the ground. Rainfall in this area of Texas can be very intense (high volume of rain in a short period of time), resulting in a substantial amount of surface water runoff. Springflow is the groundwater contribution to streamflow, often in the form of springs or seeps. It is sometimes referred to as base flow or groundwater discharge. During dry weather, springflow makes up the majority of the streamflow at Comal and San Marcos Springs. To determine streamflow, several instruments are used to measure the water level in a stream (also known as stream stage or gage height). Using well-established mathematical relations, the height of the water level is converted to streamflow (Turnipseed and Sauer, 2010). 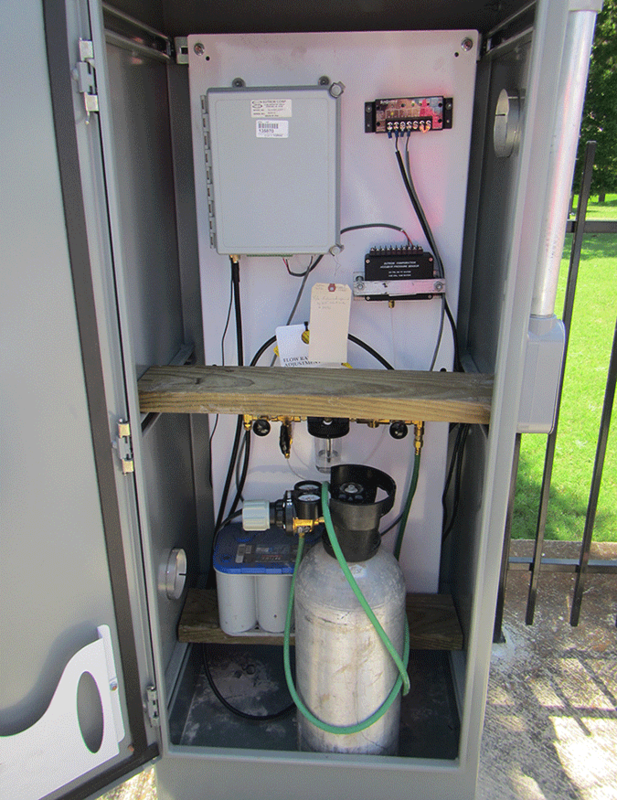 The USGS measures streamflow at gaging stations every 15 minutes. The daily average streamflow is the average streamflow measured over the course of that day (also reported in cfs). 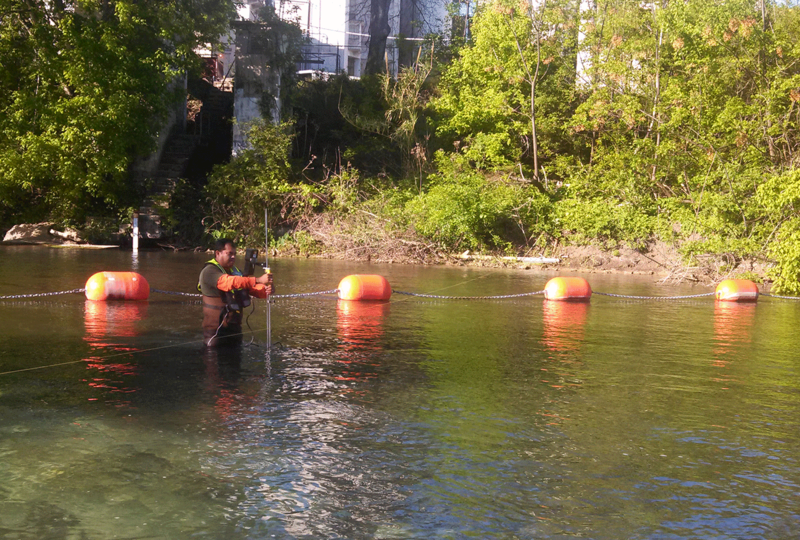 USGS staff making a streamflow measurement at the Comal River. USGS streamflow gaging station housing and equipment at the San Marcos River. Springflow at Comal and San Marcos springs cannot be measured directly because there are several places from which water comes from the ground, and many of those places are under water at Landa Lake (for Comal springs) and Spring Lake (for San Marcos springs). Hence, daily average springflow is computed from average daily streamflow data using a computer program. This approach assumes that springflow will change by only a small percentage from day to day, based on hydrologic conditions of the contributing regional groundwater aquifer. For example, if the aquifer water level is decreasing (such as during periods of drought), then the springflow will similarly decrease. An example graphical depiction of springflow separation based on daily average streamflow measurements. Therefore, the daily average springflow at USGS gaging station 08168710 Comal Springs at New Braunfels, TX is equal to daily average streamflow at 08169000 Comal River at New Braunfels, TX, except for periods when there is local surface water runoff. Similarly, the daily average springflow at USGS gaging station 08170000 San Marcos Springs at San Marcos, TX is equal to daily average streamflow at 08170500 San Marcos River at San Marcos, TX, except for periods when there is local surface water runoff. When surface water runoff from storms contributes to streamflow, a computation is performed to separate daily average streamflow into surface-water runoff and springflow. The contributions of surface water runoff and springflow are calculated by using a computer program which follows standard springflow separation methods (Barlow and others, 2015; Wahl and Wahl, 1995; and Wahl and Wahl, 1988; Swan and Condie, 1983). The computer program essentially draws a line between the springflow before the storm event and after the storm event (at points when the springflow is once again equal to the streamflow). During storm events, the computer program is not able to separate streamflow into surface-water runoff and springflow; hence, the springflow is manually estimated by USGS staff. After the storm event, the computer program is rerun and the previously estimated values are replaced with the computer calculated values. The USGS completes a series of quality-control checks to evaluate the computer-calculated or manually-estimated springflows. For example, one logic test that is performed ensures the calculated springflow does not exceed the measured streamflow. This can occur when field streamflow measurements (made at routine intervals to evaluate the accuracy of reported streamflow values) causes a “shift” to the reported discharge. Another quality-control check is to evaluate all the previously estimated values and replace them with calculated values from the computer program (for example, when streamflow returns to stable conditions after a storm event). A subsequent quality-control check is to make sure the values are all reasonable, do not exceed a reasonable percentage change from the previous day, and make hydrologic sense given the hydrologic conditions (for example, during wet or dry periods). When the data (whether calculated using the computer program or estimated manually) are reviewed, the data are posted on the USGS National Water Information System (NWIS) and marked as “provisional subject to change”. Any highlights or comments noted by the hydrographer are also posted. As a final quality-control check, all streamflow and springflow measurements are reviewed by two additional USGS staff personnel before they are published as “approved” data. For more information about streamflow and springflow, please contact the USGS Texas Water Science Center. Barlow, P.M., Cunningham, W.L., Zhai, Tong, and Gray, Mark, 2015, U.S. Geological Survey Groundwater Toolbox, a graphical and mapping interface for analysis of hydrologic data (version 1.0)—User guide for estimation of springflow, runoff, and groundwater recharge from streamflow data: U.S. Geological Survey Techniques and Methods, book 3, chap. B10, 27 p., http://dx.doi.org/10.3133/tm3B10. Fahlquist, L., and Slattery, R.N., 1997, Water Quality Assessment of the Comal Springs Riverine System, New Braunfels, Texas, 1993-94: U.S. Geological Survey Fact Sheet 099-97, 6 p. https://pubs.er.usgs.gov/publication/fs09997. 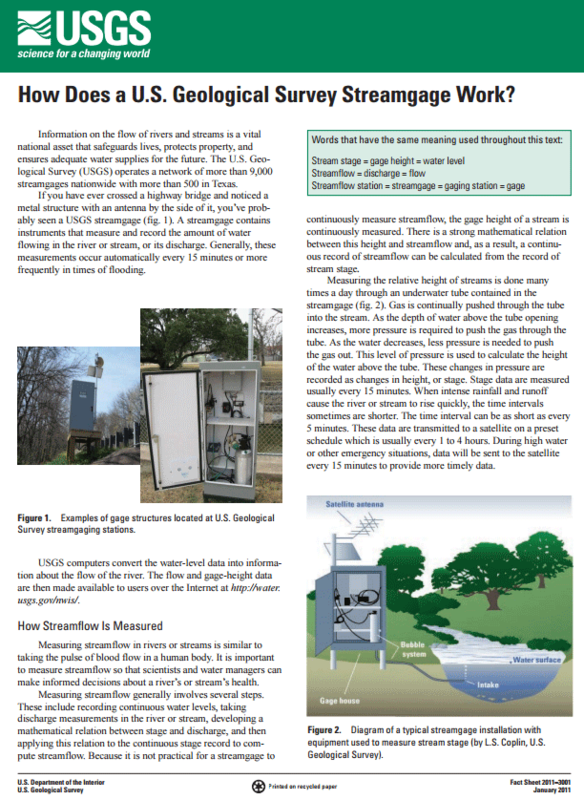 Lurry, D.L., 2011, How does a U.S. Geological Survey streamgage work? : U.S. Geological Survey Fact Sheet 2011–3001, 2 p., https://pubs.er.usgs.gov/publication/fs20113001. Slattery, R.N., and Fahlquist, L., 1997, Water-Quality Summary of the San Marcos Springs Riverine System, San Marcos, Texas, July–August 1994: U.S. Geological Survey Fact Sheet 059-97, 4 p. http://pubs.usgs.gov/fs/Fs05997/05997.pdf. Swan, D.R., and Condie, R., 1983, Computation of the base flow index: Water Resources Branch Inland Water Directorate, Environment Canada, Ottawa, Ontario, 21 p.
Turnipseed, D.P., and Sauer, V.B., 2010, Discharge measurements at gaging stations: U.S. Geological Survey Techniques and Methods book 3, chap. A8, 87 p., http://pubs.usgs.gov/tm/tm3-a8/. Wahl, Kenneth L. and Wahl, Tony L., 1988, Effects of regional ground-water level declines on streamflow in the Oklahoma panhandle: Proceedings of the Symposium on Water-Use Data for Water Resources Management, American Water Resources Association, pp. 239–249 (August 1988). Wahl, K. L., and Wahl, T. L., 1995, Determining the Flow of Comal Springs at New Braunfels, Texas, Texas Water '95, American Society of Civil Engineers, August 16-17, 1995, San Antonio, Texas, p. 77–86. http://www.usbr.gov/tsc/techreferences/hydraulics_lab/pubs/PAP/PAP-0708.pdf. Recent data provided by the USGS in Texas – including streamflow and springflow – are considered provisional data and subject to revision. Most data relayed by satellite or other telemetry have received little or no review. Inaccuracies in the data may be present because of instrument malfunctions or physical changes at the measurement site. Subsequent review may result in significant revisions to the data. Information concerning this springflow separation method or accuracy and appropriate uses of these hydrologic data may be obtained by contacting USGS Texas Water Science Center.